waw so nice! 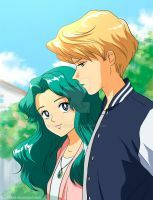 and i looooove michiru's clothes!!!! Love their outfits and their poses very much. Cute and lovely art work, well done. It's been too long since I've seen these two! Beautiful work!